Most of the petrol company in Malaysia are having reward program or redemption program as an appreciation shown to their customer. However there are some differences among these 3 petrol companies’ loyalty program if you learn in details. Let me brief you what is the difference for these 3 Malaysia petrol company reward program. I am comparing these 3 famous Malaysia petrol companies, namely Petronas, Shell and Petron (formerly known as Esso). 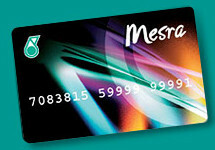 Their respective loyalty reward programs are Mesra, Bonus Link and Smiles. These loyalty programs are widely known to Malaysia citizen. Every Petronas point is equal to every “Little” of petrol purchase. Every Bonus Link point is equal to every “Little” of petrol purchase. The Bonus Link point is similar to the point as Patronas. Petron point is slightly difference than previous 2 patrol companies. Every Patron point is equal to every “Ringgit” spend in purchase petrol. By the way, those loyalty points are given not only on petrol purchase but also cover for diesel purchase as well. Once we accumulate to certain level of reward points, let say we have Petron reward points, we could go through Smiles redemption catalog to choose the reward we could get. Petronas(Mesra). Every 3000 points, we could get equal to RM30 of patrol rebate. Shell(Bonus Link). Similar to Patronas, every 3000 points, we could get equal to RM30 of patrol rebate. Petron(Smiles). For every 3000 points, we could get equal to RM45 of patrol rebate! From above, we could easily see that the rebate for Patron loyalty program is actually much preferable then the other 2 patrol companies. From above rebate rate, we can identify Petron is given 1% more rebate compare to Shell & Patronas. The rebate gap is even higher if we are consuming RON97 which comes with higher selling price. How Long We Need to accumulate 3000 points? Now we need to see how frequent we could claim the patrol rebate from these 3 patrol companies? Since the petrol rebate could only be materialize once we are able to accumulate 3000 points. Now we need to find out how long before we could accumulate 3000 points? I know everybody has our own driving habit and travel frequent. Take my data as an example, I am consuming about RM300 every months for my family transport needs. In order to accumulate 3000 points, it takes me difference time period to reach the accumulate status. With monthly RM300 spend in petrol, it takes me about 23 months before I could accumulate the 3000 points. Same as Patronas loyalty program, I have to accumulate the points for 23 months before it reach 3000 points. I have to spend 10 months time to accumulate my points from Patron loyalty program. 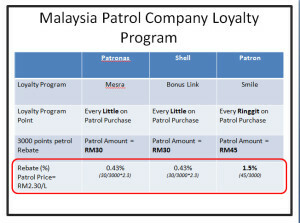 Compare these Malaysia 3 patrol companies’ loyalty programs, in order for me to reach my 3000 points qualify for petrol rebate; it takes me 10 months if I consistently engage with Patron Company. It may take me 2 years if I stick to Patronas and Shell’s reward program! With above study, I believe everybody could agree with me that Petron is offering better petrol rebate as compare to Petronas and Shell. Theoretically Patron is giving us 1.5% rebate for every single dollar we spend in petrol, however the rebate could only be materialized after 10 months we continuously shown our loyalty to this petrol company. 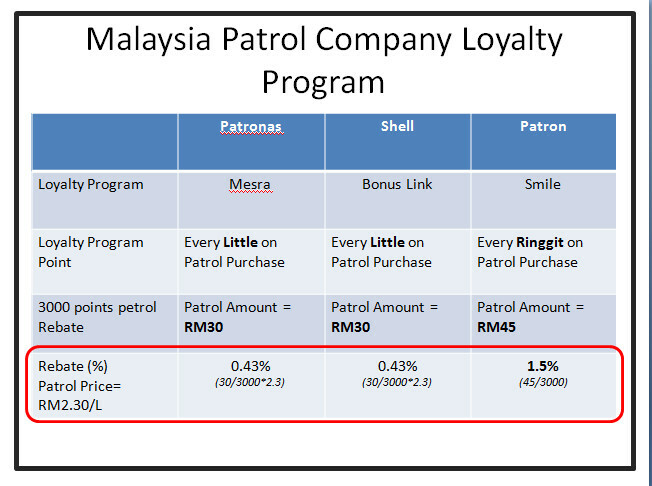 I hope my explanation and the table shown is given you a clearly pictures on Malaysia Petrol Company’s loyalty reward program. You are the consumer, now is your time to make your wise judgement. This entry was posted in Social Topic. 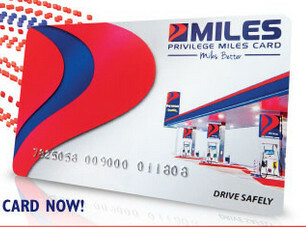 Tags: loyalty program, petrol reward program, reward points. CL is the Marketing Director for DST Technology. He also the key execution member for DSeasons for E-Commerce & Branding Development. Your review doesn’t include another two common petrol brands, BHP and Caltex. We have talking about the customer loyalty program for petrol station, how I miss out 2 common fuel companies, Bhp and Caltex, until a friend reminded me. Bhp petrol company has many outlet now especially you got the chance to travel within rural in Malaysia. The Bhp petrol station may not looks that grand as Petronas or Shell, but they do serve the fundamental business purpose. From my personal observation, Caltex is having less outlet than Bhp however the brand Caltex has longer exposure in Malaysia. From my memory, perhaps the brand Caltex exist in the market much earlier than Petronas.